On February 12, 2018, the U.S. Food and Drug Administration published the 2017 FDA Food Code that outlines that the Person In Charge (PIC) must be a to be a Certified Food Protection Manager (CFPM). The Person In Charge (PIC) is a designated person with a valid certification from an accredited program or verification of attendance from an accredited program. This person should be present during all hours of operation. For multiple permitted establishments within one physical structure (in one location)it is different. If these businesses are under the same operation ownership, such as multiple departments within one retail grocery store, the permit holder or their designee may be any one person with supervisory authority over any department. View your jurisdiction food code to verify what is required in your area. Requirements may vary from the 2017 FDA Food Code. For more detailed information about the food manager certification, please see our state requirements on the right or refer to your local health authority. This varies from City, County and State. The HRB360U® Food Safety & Enviromental Certifications will give you the proper food safety training to help you prepare for the nationally accredited certification exams of the ANSI-CFP (American National Standard Institute - Conference for Food Protection). Our food safety training courses are 100% online so you can take it anywhere with just a computer and Internet access. HRB360U® Food Handler Training program teaches you the necessary knowledge to get your food handlers card. This program fulfills the requirements of the California, Texas & Florida Health and Safety Code and helps trainees become competent food handlers. HRB360U® HACCP Program goal of our online HACCP (Hazard Analysis and Critical Control Point) training is to help prevent issues with food safety before they occur, rather than after an incident has already taken place. By implementing this online training course, food handlers are able to be fully aware of potential risks with the food they are preparing. 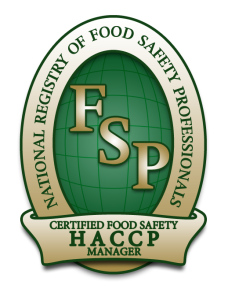 NRFSP® Exams - National Registry of Food Safety Professionals is your most trusted choice in delivering prompt, cost-effective, personal certification to your managers responsible for food safety. National Registry is your go-to source for Food Safety Manager Certification, HACCP Certification and Food Handler Certificate Program. When you think food safety, think National Registry. National Registry takes great pride in examinations and service delivery standards and practices. Customer service representatives are available via phone, email, live chat, and Twitter. When you contact National Registry, you won’t get an automated response. You won’t be forced through a series of operator prompts. You will interact with a knowledgeable customer service representative who will guide you through the entire process of purchasing items through the online store, ordering exams, administering and proctoring exams, or finding training and testing locations. Whenever you need assistance, you can count on personal service from the National Registry team. The SafeMark® Food Protection Manager Certification program is customized to meet the unique training & exam needs of the retail food industry, including supermarkets, superstores, food warehouse outlets, limited assortment stores and convenience stores. FMI developed this program, working with experts who have been training retail food managers and employees for more than 25 years. The SafeMark® certification exam is available through the National Registry of Food Safety Professionals. Right for Your - Neighborhood establishments to international chains depend on ServSafe® for their protection. Regulatory - ServSafe® training and certification is recognized by more federal, state and local jurisdictions than any other food safety certification. Safety in Numbers - Over 65,000 instructors and proctors have chosen ServSafe® over the past 40 years. Their expertise helps ensure the safety of your customers, your business and your staff. Giving Back - ServSafe® profits are reinvested in the industry educational, outreach and advocacy programs. ServSafe® Training & Certification Programs are the most current and comprehensive food, beverage and operation training programs in the industry. SURE™ (Safe, Useful, Responsible Education) offers a complete cycle of training. SURE™ makes certain that the needs of employees, managers, and trainers are aligned. NEW Food Safety Manager Course 9.0 now available for Smart Phones, Tablets, and PC’s/MAC’s. TAP® Series unique teaching process allows for a real-time uninterrupted learning experience by using colorful graphics, animations, full motion video, audio and interactive learning exercises. We provide this media rich training on any data connection, from the slowest dial-up to the fastest broadband. Major university studies show TAP® Series courses are so simple to use that people with virtually no computer experience use them easily. Educators appreciate the TAP® Series’ exceptional self-paced and self-teaching courses. The quality of these courses qualifies them for course credit while reducing already over-taxed time and facilities. NO download needed. So easy to use, we have to warn you NOT to train and drive. Click here for a demo. Click here to purchase. Whether you are interested in TAP® Series courses such as our online Food Safety Manager Certification training or our online HACCP Certificate training for personal use, as credit or non-credit courses of study, or as opportunities to increase profitability, we are confident you will find the TAP® Series provides the quality answer. © 2010 - 2015 HRBUniversal LLC • ALL RIGHTS RESERVED.